News dropped of Paul Pogba getting his very own Twitter emoji on Friday, so now he’s gone and done the sensible thing. The Manchester United midfielder switched up his look to match the new emoji. 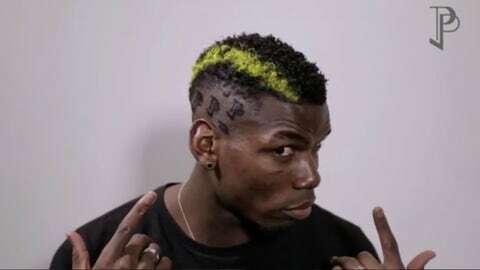 Of course, being Pogba, he added some panache to it. As the first English Premier League player to ever receive his own emoji on the social media app, it’s a big honor. He is, after all, one of the must-follow talents on the internet. And as a guy that changes his hairstyle as often as normal people change shoes, he was due for a new ‘do. The timing is plum as well, with United set to battle bitter rival Liverpool on Sunday. Pogba has a habit of debuting new coifs in major tilts, and United/Liverpool certainly fits the bill. When the ball kicks off on Sunday, it won’t be difficult to pick out Pogba. He’ll be the guy with the double Ps shaved into one side of his head, a set of yellow double Ps on the other side and a bright yellow accent stripe. And as one of the planet’s most talented players, he’ll also probably be the guy making Liverpool defenders question their existence.